1. Mix the cheese, breadcrumbs and polenta in a shallow bowl. Add the lemon zest and mix together. 2. 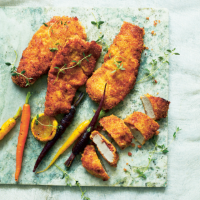 Top each pork escalope with 2 slices of pancetta. Dust with flour, shaking to remove any excess. Place the eggs in a shallow bowl and beat well. 3. Dip the pancetta-topped escalopes in the eggs and then transfer to the breadcrumb mixture, pressing in the crumbs until firmly and evenly coated. 4. Heat the oil in a large frying pan and fry for 5-6 minutes each side until the coating is golden and crispy and the meat is completely cooked through. Drain on kitchen paper before serving with steamed carrots and lemon slices. Cook’s tipSlice the zested lemon and fry for 1–2 minutes on each side to garnish.